Golden Dragonfly Press, 9780998976631, 268pp. Carolyn (Riker) Avalani, M.A., LMHC is originally from the East Coast and transplanted to the Pacific Northwest in 1996. Carolyn has a private counseling practice and is also an educator and writing coach. She's an advocate for justice and spokesperson against racism and sexism. She's written for numerous journals and anthologies. Carolyn is a poet, a lover of music, nature and the author of "Blue Clouds: A Collection of Soul's Creative Intelligence." Her second book of poems, quotes, prose and tidbits of wisdom is evolving under the supervision of her house lion, Copper. 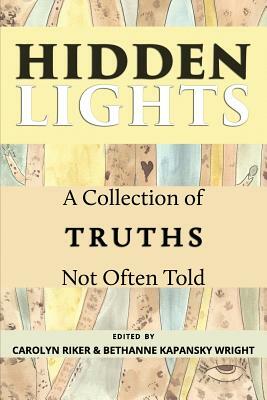 It is a pleasure and honor to collaborate with BethAnne in this anthology where voices and stories need to be shared and heard. BethAnne Kapansky Wright, Psy.D., LP is a Clinical Psychologist who recently closed her private practice in Anchorage, Alaska to move to the island of Kauai, where she is planning on continuing to do therapeutic work, expand into new creative and healing opportunities, and sit by the ocean as often as she can. She specializes in life transitions, trauma, grief work, spirituality, and finding healing in our relationships- especially our relationship with our self. BethAnne is an artist and illustrator and the author of several books including "Lamentations of the Sea: 111 Passages on Love, Loss and Letting Go" and "Heliotrope Nights: Starlight for the Mind and Soul." She is exceedingly grateful and happy to have combined forces with Carolyn and to have had the opportunity to be a co-editor of the "Hidden Lights" anthology project.